Members of the public are being encouraged to report any suspicious activity. Three people were arrested and more than 50,000 suspect illegal cigarettes worth over £10,000 seized in raids in County Durham. 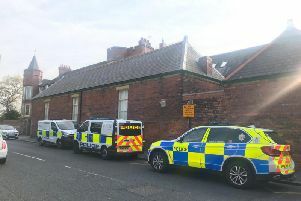 Officers from Durham County Council’s Consumer Protection Team and Durham Constabulary swooped on two premises, associated vehicles and a residential garage in the Willington and Sunnybrow areas on Tuesday, May 10. Some of the tobacco seized. A total of 52,520 cigarettes and 5.7kg of hand rolling tobacco believed to be counterfeit or without appropriate health warnings were seized with an estimated street value of more than £10,000. Police also uncovered an estimated £4,000 in cash which was also confiscated. Two men, one in his late 40s and one in his early 70s, and a woman in her late 60s were arrested on suspicion of the possession and supply of illicit tobacco and other offences. The operation came about as a result of intelligence received and was part of ongoing efforts to disrupt those suspected of being involved in supply and distribution of illicit tobacco in County Durham. Since April 2015, 463,840 cigarettes and 677 pouches of hand rolling tobacco have been seized by council officials. "Yet again we have been successful in targeting sellers of illicit tobacco at more than one level of the supply chain, tackling both the end sellers and those who are profiting from the wider distribution of illegal tobacco and the suspected criminal activity linked to it. "Working with our partners in public health and the police, illicit tobacco enforcement is just one strand of many tobacco control measures put in place to achieve our long term ambition to reduce smoking prevalence in County Durham to 5% by 2030. "The message is clear to those still tempted to engage in the supply of illicit tobacco. Further investigations are underway to probe the extent of the alleged supply network in County Durham. Anyone found guilty of supplying counterfeit tobacco could face up to ten years in jail, unlimited fines and could have their assets seized. Anyone who wishes to report illicit sales of tobacco can do so in confidence by calling 0300 999 0000.